Tilray Inc. (TLRY shares are falling 17.5% after hours Wednesday after being halted five times during the afternoon session. Tilray shares closed the intraday session up 38.12% to $214.06. The stock jumped more than 90% intraday Wednesday, September 19 leading to Tilray being halted up 69.92% to $263.34. The stock was halted once again during a subsequent selloff, up 8.6% to $168.33. Trading resumed, with shares jumping another 40% before being halted once again. 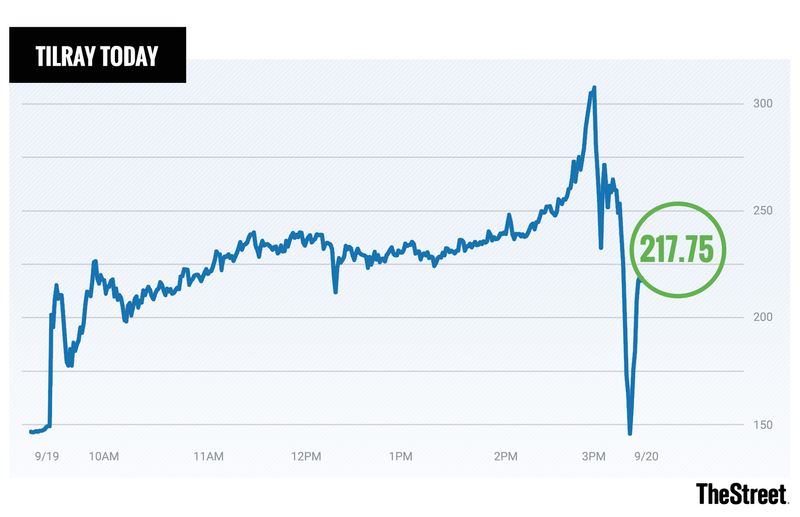 A chart showing shares of Tilray throughout the day on Wednesday. The stock debuted in July at just $17 per share. Investors either really liked what CEO Brendan Kennedy had to say to Jim Cramer Tuesday night on "Mad Money" or the company's stock is a bubble waiting to burst. Tilray also lifted other players in the cannabis space. Shares of Cronos Group Inc. (CRON - Get Report) gained 21.2% and Canopy Growth Corp. (CGC - Get Report) rose 5.8%. Wine and spirit giant Constellation Brands Inc. (STZ - Get Report) was among the first to sniff out the opportunity in cannabis, spending $191 million in 2017 for a 9.9% stake in Canopy Growth. Constellation has since dropped$4 billion more to raise its stake in Canopy Growth to 38%.